The Algo Variable pane is located in the center of the Algo Dashboard window and allows you to modify algo variables, create templates, and launch algos that you have selected in the Algo Explorer Pane. There are two types of variables displayed in the Algo Variables pane, algo specific and standard. Algo-specific variables are added within ADL® (Algo Design Lab) and can include such things as order quantity or instrument type. The common variables display below the algo specific variables and consist of the Algo Instance and Client Disconnect Action. Any value changes made to both specific and common variables can be saved as a template for future use. Tip: Algo variables can also be linked to an Excel spreadsheet. Save Template: Save changes to an existing template. Save Template As: Save changes to a new template. Rename Template: Change the name of an existing template. Delete Template: Removes the template from the Algo Explorer pane. Starts the selected algo. Review the Audit Trail if an algo fails to start. Displays the variable name that was defined in ADL® (Algo Design Lab). Algo specific variables vary for each algo, and can include things such as quantity or instrument type. Order routing credentials can be specified for each Instrument Block. Algo Instance: Name of the algo instance. This will default to the name that was defined in ADL® (Algo Design Lab). Client Disconnect Action: Defines the action taken on a working algo upon connection loss with the Algo SE server without an orderly shutdown. Pause: Stops further actions by the algo order. <Market> Routing: If enabled in Global Properties, this field is displayed and allows you to select a customer and account for routing the order per market instead of per instrument. 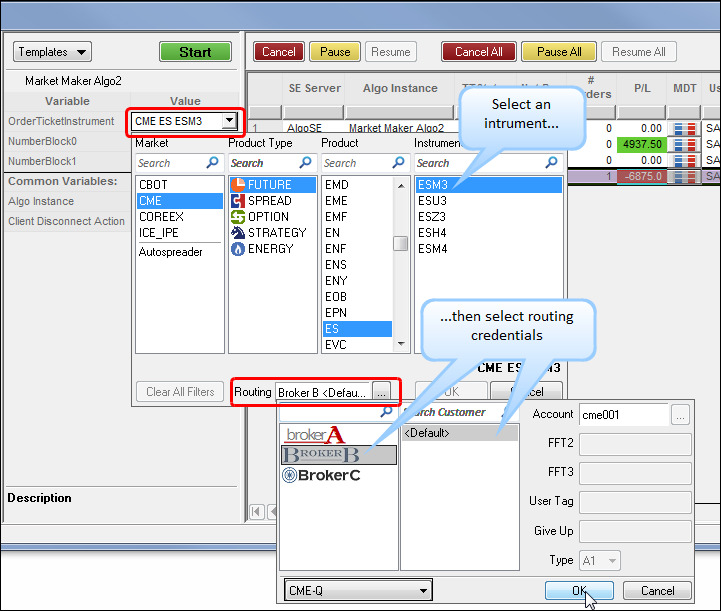 To enable routing per market, click the Per-market Customer Selection for ADL Algos checkbox in the General section of the X_TRADER® Control Panel Settings | Properties | Order Entry tab. When you select an Algo Definition or an Algo Template, any missing or invalid parameters are marked with a “!” icon. When you hover over the icon, a tooltip is displayed that explains why the parameter is invalid as shown in the following figure. 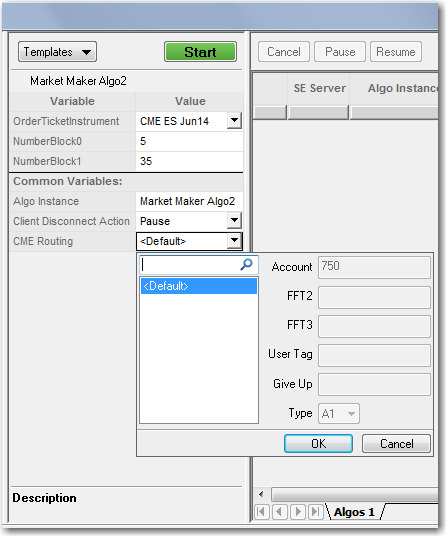 The Algo Variable Pane allows you to select routing credentials for each Instrument Block used in an Algo Definition. An instrument variable must have a valid Broker (X_TRADER ASP), Order Gateway (for a non-Autospreader contract), or a Customer Default selected before an instance of the algorithm can be started. If enabled, the per-market customer order routing selection for an OTA overrides the routing selected in MD Trader or the Market Grid, as well as the customer selection for the Instrument Block. 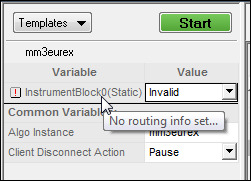 However, if per-market customer selection is enabled but you select routing credentials for the instrument block, this setting overrides the per-market setting (that is, you can toggle between customer routing selections). Note: Per-market routing for an Autospreader contract does not override the customer routing that was manually configured for that contract. For an OMA, customer routing cannot be changed for any working orders. However, if you change the customer routing from per-intrument to per-market, for example, any subsequent orders launched by the algo will be routed with the changed (e.g., per-market) customer selection. Click the drop-down arrow in the instrument variable field to open the Instrument Explorer. Select a market, product type, product, and Instrument (contract). Click the Routing button to select a broker and/or customer account, as well as an order routing gateway. 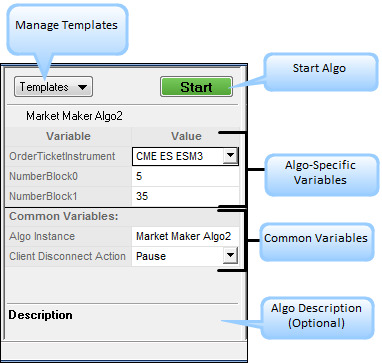 In a X_TRADER ASP environment, you must select a broker for each Instrument Block used by an algo. After selecting a customer, enter any other order routing or clearing account information (FFT2, FFT3, etc.) that may be required. If per-market customer selection is enabled in Global Properties, select a customer and account from the <Market> Routing field in the Common Variables section of the Algo Variable Pane. For details about selecting an Order Gateway or Broker in MD Trader, refer to MD Trader - Order Entry.